I bow my head down as I walk into a brisk wind, the two strong blades of a helicopter loudly turning above my head. “I can’t believe this is really happening,” I think as I climb up into the bright-red Bell Long Ranger. I quickly fasten my seatbelt and then fumble with the headset, big and heavy on my head, as the pilot readies for liftoff. The door slams shut and I feel a rush of emotions- eagerness, excitement, nervousness, and a pinch of panic. As I start to feel the effects of adrenaline, the helicopter gently lifts off, hovering above the tarmac. Before I know it, we are picking up speed, sweeping above the town of Canmore and heading towards the mighty Rocky Mountains. This is it- my first helicopter ride! I have long wanted to go up in a helicopter, so was elated to have the opportunity to do just that with Alpine Helicopters in Canmore. I’ve been visiting Alberta’s Rocky Mountains for over 30 years but I’m still filled with wonder each and every time I see them. Although I’m a frequent visitor to Canmore, I have never seen the mountains quite like this before! Seeing the Rockies from above brings a whole new perspective, and with that, a whole new appreciation. I’ve always been amazed by mountains, fascinated by how the earth can shift and change so drastically, pushing up enormous slabs of rock to create dramatic landscapes. Our Canmore helicopter tour allowed me to experience these natural wonders in a new way. I felt like I was seeing the Rocky Mountains for the first time- and it was thrilling! For 30 minutes we flew past jagged, snow capped peaks, through valleys, over blue lakes, even getting an up close view of Gloria Glacier hanging off Mount Assiniboine. Our pilot pointed out the sights as we flew past, naming all the mountain ranges, lakes and glaciers. At times, I couldn’t believe how close we were to the rocks. Having the peak of a mountain at my eye level, then looking down to see how high we were, made me realize just how huge these mountains really are! I was so in love with the scenery that I wish we could have stayed up there all day. The 30 minutes went by unbelievably fast! As our pilot started heading back to Canmore I felt a twinge of sadness that our helicopter tour was already over. Feet safely back on the ground, I immediately asked Mike if we could go again! All day long, I kept thinking about the spectacular views from the helicopter. I had a new energy and excitement about the mountains I have visited so often over the years. Our Canmore helicopter tour reminded me of the importance of seeing a familiar place from a new perspective. It’s very rewarding not only to try something new, but also to discover a different side to a place you thought you knew so well. Here are some pictures from our Alpine Helicopters sightseeing tour. 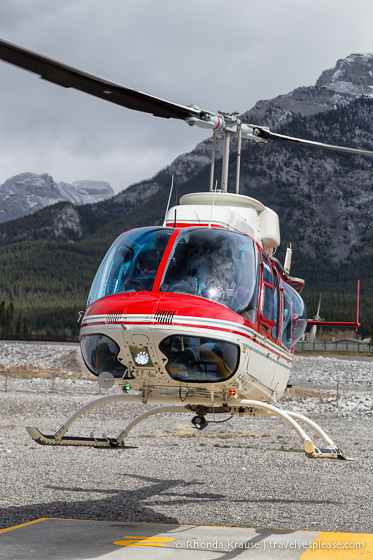 Our Canmore helicopter tour was with Alpine Helicopters. For my first time in a helicopter, I felt safe knowing that we’d be flying with some of the most experienced pilots in the industry. We did the 30 minute Mount Assiniboine Glacier Tour. The tour costs $330/person (plus tax) and flies you past the Three Sisters Peaks, over the Spray Valley and Spray Lakes to Mount Assiniboine and Gloria Glacier, and along the Goat Range. Alpine Helicopters also offers a 12 minute tour, 25 minute tour, and 45 minute private tour for two. We recommend doing the longest tour your budget allows. Honestly, the 12 minute tour would just be a tease, considering how fast our 30 minute one went by! To help cut window glare when taking photographs, use a circular polarizer on your lens. This really helped eliminate window reflections and haze, increasing contrast in the sky. Information was updated February 2, 2019, but can change without notice. Please confirm directly with service providers. For you convenience, here is a list of hotels in Canmore. Please consider booking your Canmore accommodations through the included link. It costs nothing extra and helps support this website.